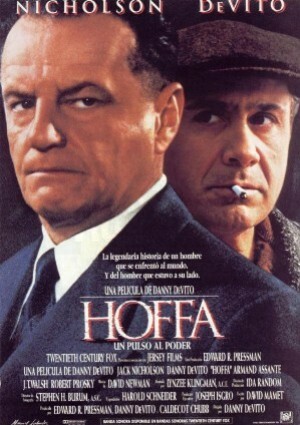 Jimmy Hoffa fue un carismático y controvertido líder sindical. Criado en los barrios pobres de Detroit, creó el sindicato más grande del mundo cuyo liderazgo le llevó hasta los más altos círculos del poder. Enfrentándose a los Kennedy, fue definido como "el símbolo viviente de la corrupción". Jack Nicholson, Danny DeVito, Armand Assante, J.T. Walsh, John C. Reilly, Robert Prosky, Natalia Nogulich, Kevin Anderson, Joe Greco, Frank Whaley, Karen Young, John P. Ryan, Nicholas Pryor, Paul Guilfoyle, Cliff Gorman, Joanne Neer, Don Brockett, Jim Ochs, Joe Quasarano, Nicholas Giordano, Dale Young, Jennifer Nicholson, Don Vargo, Anthony Cannata, Valentino Cimo, Willy Rizzo, Gerry Becker, Tom Finnegan, Joey Dal Santo, Angela Block, Anna Marie Knierim, Alton Bouchard, Jeff Howell, Fred Scialla, Christopher Otto, Annette DePetris, Dinah Lynch, David Regal, Allison Robinson, Gary Houston, Chet Badalato, Dean Wells, James 'Ike' Eichling, Bill Dalzell III, Alex A. Kvassay, Cha Cha Ciarcia, Dave Shemo, David Calvin Berg, David Sconduto, Dennis Tolkach, Kathy Hartsell, Jacqulyne Marie Cardillo, Jillian Alyse Cardillo, Joanne Deak, John Judd, John Hackett, John Malloy, Kevin Crowley, Larry John Meyers, Peter Spellos, Judge Thomas A. Van Tiem Sr., Kirk Palmer Anderson, Louis Giambalvo, Marty Perlov, Paul M. White, Peter J. Reineman, Philip Perlman, Richard Schiff, Robert L. Feist, Robert Maffia, Robin Eurich, Rudy E. Morrison, Sam Nicotero, Samson Barkhordarian, Sean P. Bello, Sherri Mazie, Shirley Prestia, Staci Marie Marcum, Steve Witting, Steven E. Goldsmith, Thomas D. Mahard, Tim Gamble, Tomasino Baratta, William (I) Cameron, William (II) Cameron. Danny DeVito (Dirección), Stephen H. Burum (Fotografía), David Mamet (Guión), David Newman (Música).